The airlines old-edition name badge. 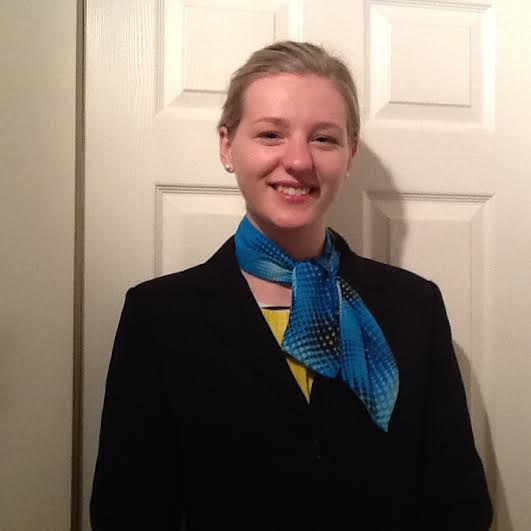 Thanks to Holly for modelling the airlines old scarf and shirt! The Duty-free magazine, which features tax discount products for customers. Left, the airlines food carton. The food has been chosen by chef James Martin. I had the fabulous opportunity to visit the Jet2.com base at East Midlands Airport on the 30th of April 2016. A huge thank you to all of the amazing team and a huge thank you to Sarah Marshall for organising the visit and Jade Wagstaff who was the Duty Manager that day! At 10 AM, I arrived at the airport and headed to the brightly signed Jet2.com and Jet2holidays desk to meet the team and make them aware that I had arrived. Shortly after speaking to the person on the desk, Jade (the Duty Manager) came down from the offices to meet me. I introduced myself and we talked about the details of the day. Here is my Monarch cabin crew hat that was donated by Monarch Airways pictured with other Monarch goodies. Here are my goodies sent from Head Office!